As recently as 4 months ago, this was rare in Hamsatu’s household. Food was scarce, and when a meal was available, it was usually made from millet or corn flour—the cheapest food available. 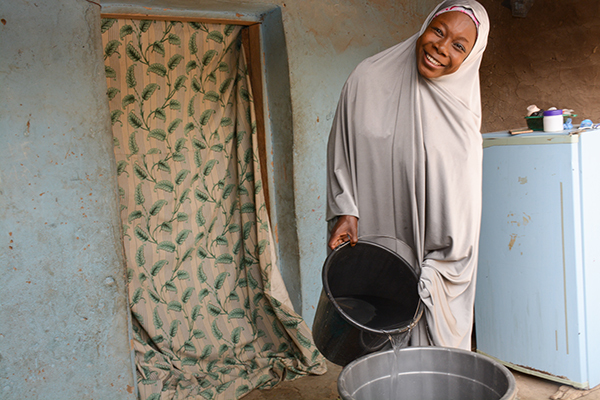 Hamsatu and her children live in Dapchi, in the state of Yobe, Nigeria. In northeast Nigeria, Boko Haram has triggered a humanitarian crisis. More than 2.1 million people have been forced to flee their homes. Yobe, Adamawa and Borno are three of the most affected states. Nearly 7 million people—more than half of whom are children—need humanitarian assistance. In 2014, at the height of the insurgency, Hamsatu’s husband fell ill and died. Hamsatu had to pull her children out of school so they could help her sell spices to earn money to survive. She also began selling cooked food at the market, but she could still barely afford two meals a day for her family. Several times, she and her children went to bed hungry. As displaced people flee from violence, they settle in urban areas or in communities where they have relatives. This has led to a population explosion in communities across the state. In an area with a history of economic deprivation, more than 78% of internally displaced people, or IDPs, live in host communities. 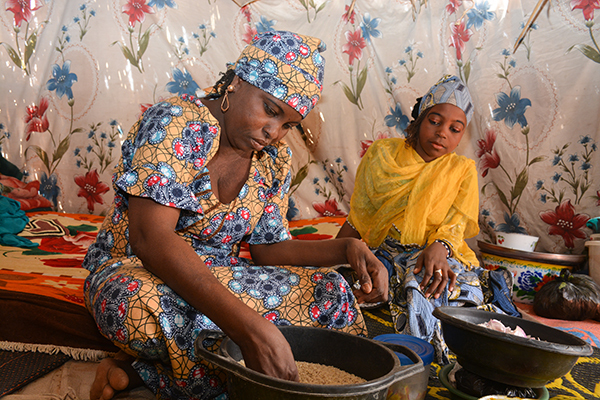 Host families share their food and resources, like shelter, water and health facilities. This places pressure on infrastructures that are already strained. Haruna Husaini is 63 and the eldest in his family. Twenty-seven people live in his household, including his 8 children. Two of his brothers fled with their families when their communities were attacked. They all now live with Haruna in Dapchi. “I have to take care of my younger siblings. No matter how hard things may be, you do not turn family away when they need you,” Haruna says. Like many in the region, Haruna is a farmer. But people are discouraged from growing crops taller than their waist now, so Boko Haram cannot hide in their fields. This means that in some areas farmers have been unable to cultivate their fields for 3 years. In addition, markets and the roads that access them are often targets of bombings and attacks. Therefore, even in areas where farming has continued, people cannot sell their harvests. Farming families that traditionally grew their own food now must buy their meals, and on lower incomes than before. Using her first wallet, Hamsatu buys staple foods like rice, beans and pasta, which account for 70% of her total food budget. With her second wallet, she purchases nutrient-rich food like meat, fish and vegetables, using the remaining 30% of her food budget. And with her third wallet, she buys nonfood essentials like shoes for her children, sleeping mats, jerrycans, soap and water purification tablets. Each family member gets $8 per month stored in their 2 food wallets, and families receive a total of $10 per month in their nonfood wallet. With limited access to water, hygiene and sanitation items, diseases can quickly affect communities. As a prerequisite to receiving food and WASH items from CRS, people must attend nutrition and hygiene classes once a month. At class, they learn how to prepare nutritious meals using local food. They also learn proper hygiene practices. “My children become ill less often now. They are no longer constantly hungry and lethargic. They no longer have to help me sell spices just to make ends meet. I have put them back in school and they attend classes regularly,” Hamsatu says. Working alongside the Federation of Muslim Women’s Associations in Nigeria, the NIRA Community Development Foundation, the Northeast Youth Initiative Forum and local Caritas partners, CRS helps displaced families and vulnerable host community households meet their food and hygiene needs through a strategy called Cash and Asset Transfer. CRS tops up electronic vouchers with credit, and families use this credit to purchase food and nonfood items from registered vendors. Hamsatu now saves part of the money from her spice business. Her first priority is to complete a mud house on her land. “By the time the rains come, we will have four walls around us and a roof over our heads that does not leak,” she says with a smile. CRS programs in Yobe are part of a strategy for Nigeria, Niger, Cameroon and Chad. These are the four countries in the broader Lake Chad basin affected by Boko Haram. CRS provides lifesaving food, WASH and shelter assistance to conflict-affected families. CRS is expanding in the region to provide agricultural support that will aid recovery and facilitate livelihoods.